Even though Apple hasn't said a word about a 13-inch MacBook Pro revamp to include a Retina screen, that hasn't stopped speculation about the rumored device from continuing to sprout up. Reports of the new laptop first surfaced this summer, though no such device was released alongside the 15-inch Retina MacBook Pro when that product launched last June. More whispers of a 13-inch model continued to arise, with the latest indication pointing to Apple gearing up for production earlier this month. Adding more fuel to the fire are reports Friday of actual pricing for the smaller MacBook Pro, indicating Apple may be ready to formally introduce the new laptop. Base model to start at $1,699? 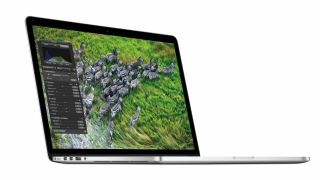 Sources speaking with 9to5Mac are reporting the price for the 13-inch Retina MacBook will start at $1,699 (UK£1,061, AU$1,645). That would make the new model some $500 (UK£312, AU$483) more expensive than the standard 13-inch version, but would also start it out at the same amount less than the 15-inch Retina MacBook Pro. Those same sources also indicated the higher-end model of the 13-inch laptop will come in at $200-$300 (UK£124-£187, AU$193-$290) more, which would still keep it under the base price of the 15-inch version. Many believe the 13-inch Retina MacBook Pro will debut along with other smaller devices like the iPad Mini and possibly a new Mac mini at an Apple event Oct. 23. Any new laptop announcements would certainly take a bite out of Microsoft's own Oct. 26 Windows 8 release. With a few short days to go until Apple's event, we won't have much longer to wait to find out what Cupertino has in store.